The World's Largest Military Airshow takes place in July at RAF Fairford, and join me as the countdown starts to RIAT 2010. From the Vulcan bomber to the Battle of Britain Memorial Flight, this year's event promises to be a cracker! Heavies hoping to be seen & heard at RIAT! Last year at the RAF Fairford, there was a notable absence - that of the B1 bomber in the skies, sure enough one was on the deck in the static display, but it just wasn't the same as having a thunderous Lancer ripping the skies apart, and causing those stomachs to reverberate with it's special take off. There was also the lack of a flying C-17 last year thanks to operational requirements, which of course takes priority over any air show plans, and rightly so, but still disappointing for the airshow fans. This year though there is already one booked in for the flying display, and with a bit of luck this year it will remain in the programme. 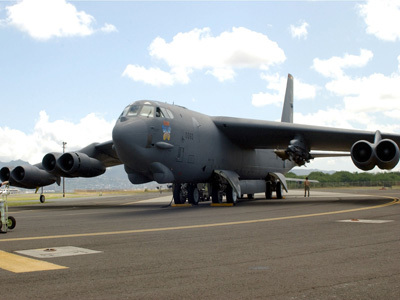 The B52 is also a regular at RIAT, with its screeching engines that bleed the ears nicely on take off, and that impressive nose down lift off too a common sight at Fairford, and hopefully this year we'll get to see it all again. The Avro Vulcan is of course on its road to recovery once again after the public - largely thanks to a anonymous donation of £458,000 - brought her back from the brink of a trip to a museum, and I for one cannot wait to see the fantastic take off, and famous howl once again from those Olympus engines. All that's needed now to complete the set would be a tasty C5 Galaxy - now that, along with the other heavies listed, would be a most fantastic air display to head to, and one that I'm sure would live very very long in the memory! 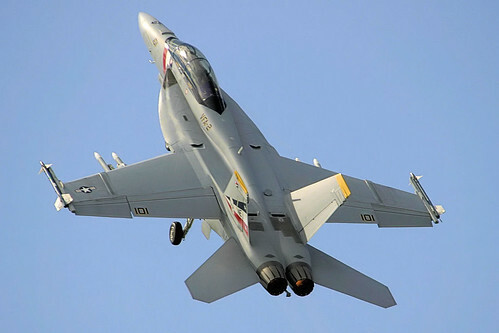 There is bound to be plenty of noise around Gloucestershire once again this year as the return of the F-18 Super Hornet has been confirmed, in what is always a powerful and ear bashing display, and the Us Navy will I'm sure be keen to put on a good show! Another master blaster is the Typhoon which will almost certainly be showering the skies with bags of noise, and it may well team up with a Spitfire as part of the Heritage Flight at this year's air show which of course commemorates the 70th anniversary of the Battle of Britain, and I'm sure officials are preparing a wonderful fly past similar to the 100 years of the Navy fly past last time, although lets hope none are so high and far away as the Sea Venom was! There will also be the return to the skies of the RAF Role Demo, which will include after a four year absence, a return to the display for the Harrier GR9, and also not one, but 2 Tornado GR4's, so ear plugs at the ready! As far as team displays are concerned, the Patrouille de France return in their Alpha Jets and are sure to decorate the skies in red, white and blue, as I'm sure will the world famous Red Arrows, who will have hoped to recover from their set back in Europe this year. Moving across Europe a little, and the Dutch will be represented by the F16 Fighting Falcon once again, which will be sure to have people desperate to see if flares can be used, but unfortunately it looks as though that won't happen again this year. One team that always makes its way over to the UK is the Royal Jordanian Falcons, who are now cemented in to the show's history, and always a delight to watch. RIAT have also been celebrating participation from what will be the 52nd nation to support the Air Tattoo, that being the Sri Lankans, who are sending over an Antonov An-32B for this year's show, and will I'm sure be a highlight in the static park. So, plenty of good things to look forward to, and once the B1, B52, and Vulcan are all confirmed as Flying, I'll certainly be counting down the hours, minutes, and seconds to the display this year, which is shaping up to be one of the best for many a year. Now, what about the B2 anyone??? Some big news broke last week on the official RIAT website, as it was confirmed that the F22 Raptor would be winging its way over to this year's Royal International Air Tattoo in July. This follows it's brief appearance at the cancelled 2008 event where the rain ensured the public didn't get to see too much of the sleak looking fighter. So, this year, is a case of take two, and hopefully the weather will play ball and allow us all to see the F22 in action, in what we hope will be blue skies in the Cotswolds. This is certain to boost ticket sales further, and is the first US act to be confirmed for the event, now all we need is many more to follow, and this will be one of the most eagerly awaited RIAT's of all time, what with the Vulcan being saved at the last minute, let's hope that the likes of the B1, B2, and B52 will all be present at the air show, with maybe the C5 Galaxy thrown in for good measure, it would be great to see a list of heavyweights thrown in there! The Red Arrows will certainly be at RIAT this year, with the confirmation now on their website, along with the Battle of Britain Memorial Flight, also confirmed on their site too. Just under 4 months to go now until the event of the year, and the excitement is certainly building. 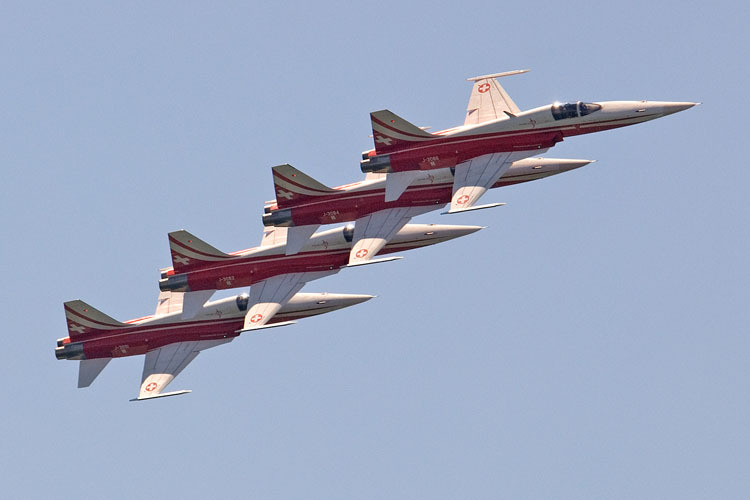 The first confirmed act was a rare Cold War fighter from the Romanian Air Force, who have agreed to send over a couple of Mig 21 "Lancers" to the show which is a great coup for the RIAT Team. One of the aircraft will take part in the flying display, whilst the other will sit in the Static Park. The "Lancer" looks set to leave military service in 2012, but is still used as NATO cover for Lithuania, Estonia, and Latvia. The Swiss national display team, the Patrouille Suisse are set to grace the skies over Gloucestershire in July, aswell as the P3 Flyers, who are set to send 4 of their Pilatus P3's over to display. It is hoped that the Boing 757-200 from the New Zealand Air Force will return for a second successive year following an impressive display last year at RIAT. It would certainly be another great chance for the public to see what was a truly great display in 2009. There will I'm sure be further additions in the not too distant future as the countdown continues to the greatest military airshow in the world! As the countdown continues to next year's Air Tattoo, the first stage of the ticket prices have been revealed on the RIAT website, concerning the Early Bird tickets. As with last year's ticket strategy, the tickets are 'Day specific' meaning that you'll have to commit yourself to one of the two days if you want to pay the Early Bird price, which is £32.50, postage & packing is at this stage FREE, and there is also no Booking Fee to pay right now either. This will apply until 28th February 2010. Prices for the 'either day' Earlybird ticket are yet to be released, but will more than likely be around the £40 mark, like last year's show. Under 16's continue to go FREE which is still a cracking deal for anyone that qualifies. Mach 3 is a limited membership of only 1400 people, and the 6 day package goes straight through from Wednesday 14th July - Monday 19th July, and includes admission to the Park & View on each of the non-show days, and of course includes tickets for both show days. There are also plenty of other goodies which include the daily flying programme, RIAT 2010 programme, and dedicated parking. Mach 2 is the 4 day package, which is limited to just 250 members, and gives you a seat in the grandstand enclosure, as well as dedicated parking Friday through to Monday. Mach 1 basically covers both the show days, Saturday & Sunday, and gives you enclosure access and a seat in the grandstand. Members are limited to 150 on Mach 1. The F22 Raptor is leading the way in the Poll for Air tattoo fans preferred choice of Aircraft to attend next year's Airshow at RAF Fairford. 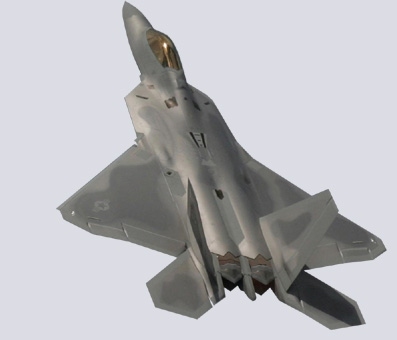 The Raptor has a total of 60 votes, just four ahead of it's nearest rival the Mig 29 Fulcrum, and it's going to be a close battle one expects throughout 2010 too. Hopes are high for both aircraft to attend the show, with Farnborough taking place next year too, which normally increases the level of quality of participants, keen to show off their products to the rest of the world. The F22 was of course here for the 2008 show that sadly got cancelled thanks to shocking weather that the area received in the week leading up to the show, but a select few managed to get a glimpse of the Raptor during it's practice the night before the Saturday show was due to take place. The Mig 29 , which has received 56 votes, hasn't been over for a few years, but there is always a clamour for it, so hopefully the organisers of next year's Tattoo will be able to persuade the powers that be to bring it over to the largest military air show in the world. Just behind the Mig, is the B2 Spirit, a surprise, considering it's not the greatest of displays, but obviously the look of the aircraft is the appeal, with the "flying wing" look to it, ensuring that it is a favourite amongst the crowd. It seems a long while ago that the B2 made it's first appearance at a UK airshow, with 2 USAF fighters either side during it's flypast, having flown all the way across from the USA. The B2 Spirit has 36 votes, whilst another B2, this time, the Vulcan B2, has 29 votes, and has become (once again) a firm favourite amongst airshow fans, the sad fact though is that money is running around thick and fast on the project, partially down to the mail strikes, which have prevented many receiving newsletters requesting financial help in keeping XH558 in the air. It would be hard to take the Vulcan being grounded after such a great year in 2009, with hundreds of thousands of people having witnessed great displays complete with "the howl", but the Vulcan to the Sky team need £400,000 before Christmas to remain on course of bringing that howl & display to the public next year too - you can donate here. The B1 bomber is just two votes behind the Vulcan in the Air Tattoo Poll, and was sorely missed in 2009's RIAT, even though there was a presence of 1 bomber - on static - at the show, but the great thunderous sound of the B1 was not there, something I personally was disappointed by, considering it had become a regular fixture on the Air Tattoo calendar - hopefully it will take it's place in the flying display next year. Finally, just one vote behind the B1 is the A10 Thunderbolt, which has not been included in the flying display for some time, but would certainly be a most welcome addition given it's unusual shape. There are many A10 fans in the UK, but they are seldom seen in the skies, so come on US Air Force, let's see them up there next July! The Poll will of course continue, and feel free to vote on the aircraft that you'd most like to see at Air Tattoo 2010! Yes, it's a little early in the day, but the countdown to Air Tattoo 2010 has now begun, and next July, the skies of Gloucestershire will once again roar to the sound of military aircraft from all over the world. Follwoing the success of this year's show which featured the Vulcan, B52, Red Arrows, Rafael, F18's, and a superb tribute to the Fleet Arm, hopefully next year's display at RIAT will be equally if not better, and don't forget that Farnborough takes place next year, so the chances of seeing both the F22 Raptor & the Rockwell B1 bomber are higher than normal. It promises to be an excellent show next year, with the theme being based on the Battle of Britain's 70th anniversary, so we can expect a huge involvement from the aircraft prominent in that battle. Maybe a Fly Past of the aircraft involved could be on the cards. The fun will all begin at next year's RIAT on Tuesday 13th July, as the first items, normally a select few from the USA start to arrive, followed by many many more arrivals on the Wednesday & Thursday, with a mixture of arrivals and practices on the Friday. The show days will of course be on the Saturday & Sunday, with the Departures Day at Fairford being the Monday. Everyone starts to get their wish lists sorted now, and hopes that they will be confirmed as from next Spring onwards, but for now, we can dream about the content of the world's best military airshow. If you are reading this blog then please feel free to comment below, and maybe include what would be in 'your airshow' if you had the chance to stage it. Or just put down what you would you like to see at RIAT 2010. The prices for RIAT 2010 will more than likely be released in November or December this year, so keep your eyes peeled for that. For now though, check out the highlights of the Air Tattoo 2009 on the side of the page, and enjoy! What would be first on your wishlist for 2010? Welcome to The Great Mortgage Pay Off !! !